The Wall: this is what we call the world. Our scholars and priests have given us (sometimes contradictory) reasons for the Earth’s verticality, but for us, it has the force of plain fact. From birth, from the first day our mothers carry us on their backs, until the day when we have no more strength to hang on to the holds—as with me, today—our entire existence unfolds above a never-ending void. Once we’ve accepted its sting and its temptation, the Wall provides for all our needs. It feeds, waters, shelters and even cheers us. And we’d hardly have any reasons to complain if it weren’t for the vertical horizon that both attracts and repels. Yes, the void is indeed the crucial question of our lives, the great riddle our scholars debate, the moral axis of our existence, which we attempt, no doubt vainly, to escape with an ascent that we wish to believe just as infinite…. The void saw us born; it watches us climb, live and die; it will greet us with indifference on the day we die and serve as our only grave; it alone likely knows the final meaning and ultimate goal of our quest. It’s no wonder that some hope, by willingly letting it swallow them, to find a revelation that life refuses to give. Born in 1949, Sylvain Jouty is the author of five novels and a biography of Hungarian Tibetologist Sándor Kőrösi Csoma. An avid mountaineer, he has published more than a dozen books on mountains and climbing, including several reference works, and for fifteen years, he served as the editor-in-chief of the magazine Alpinisme et Randonée. His three books of short fiction have won several awards, including the Prix Renaissance and the Grand Prix de la Société des gens de lettres. He is a member of the contemporary French fabulist movement La Nouvelle Fiction. His work has been translated into Russian, Spanish, Italian, and German. 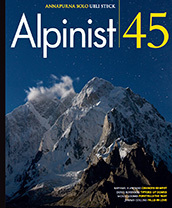 You are currently reading Sylvain Jouty in Alpinist Magazine at EDWARD GAUVIN.